The U.S. Department of Agriculture has been deploying civilian agricultural experts to Afghanistan since 2003. Among the nearly 100 who have accepted the challenge was Steven Thomas Stefani IV – “Tom” to his family, friends and colleagues at the U.S. Forest Service. Today we are gathered to honor Tom, who until his untimely death in October 2007 was a model of how Americans and federal employees can make a positive impact on the lives of those around them. Tom was raised in Auburn, California. His friends remember a sweet-natured kid with a sideways smile who ran around in oversized cowboy boots and a giant hat falling over his eyes. He was the kind of boy who worked hard and made his parents proud. He raised prize-winning sheep for the local fairs where he was a standout 4-H-er. He was an Eagle Scout and an honor student. And like his parents, Barbara and Steve, Tom lent a hand to those in need in his community, helping to organize fundraisers and gatherings. As a student, Tom studied soil salinity in the deserts of the Western United States. And as a Range Manager for the U.S. Forest Service in Nevada’s Humboldt-Toiyabe National Forest, everything began to fall into place – his Eagle Scout background, the 4-H accomplishments, years of helping his Dad with the family construction business, his education, and a lifetime of caring for animals. Tom loved the Forest Service and he loved the outdoors. Naturally, the challenge of Afghanistan’s beautiful, hardscrabble landscape beckoned to him. Like so many other dedicated USDA employees, Tom requested to serve in Afghanistan because he wanted to work to improve the lives of the Afghan people who live in this great country, people who have suffered through years of strife and conflict. While some people saw only denuded grazing lands and wasted soil in Afghanistan, Tom recognized the opportunity to restore a once legendary agricultural region. He accepted his responsibility to serve as he had so many other challenges in his life — he embraced it in a great, big bear hug. In Afghanistan, while Tom was developing projects he worked directly to plan a large-scale poultry farm and a cold storage facility. He worked alongside grape producers to improve trellising methods. His contributions were real and they’re lasting. Tom made the ultimate sacrifice to this nation and to our nation when his PRT team convoy was sabotaged by roadside bombs. But unlike his assailants — who scattered into the rocky hills like shadows – Tom, even today, continues to accomplish positive things for the people of Afghanistan. While Serving in Afghanistan, Tom decided that he would build a playground, but he was killed before he could initiate the project. So, his family collected contributions toward his dream. And today, as a result of our efforts to get the Minister of Finance to approve that playground equipment, two containers of equipment are en route to this country. build this great country and build better lives. His life and his work and the stories about Tom’s big heart and sideways smile will always be his greatest legacy. But to the 1,000 U.S. federal civilian employees here in Afghanistan who have also responded to the call of duty, Tom’s story represents the essence of their service. Today USDA is celebrating and honoring Tom’s life of service – and particularly his work here in Afghanistan — with the establishment of the Tom Stefani Award for Reconstruction and Stabilization in Fragile States. We intend to grant this award annually to one or more employees in recognition of their leading efforts to rebuild the agricultural sectors of post-conflict countries. Read the Secretary’s full remarks here. 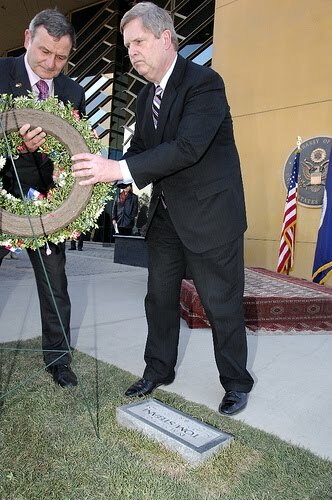 Ambassador Eikenberry also made his remarks during the ceremony. In 1976, when she was in her mid-40s, Alison Palmer brought a class-action discrimination suit against the U.S. Department of State because she was tired of being passed over for jobs as a Foreign Service officer. The parties agreed to dismiss the class action because the State Department had finally demonstrated compliance with court orders, made reparations to affected women and modified hiring and personnel systems. She was hired as a Foreign Service officer in 1959 and specialized in African affairs. She served in what was then the Congo in central Africa and then-British Guiana on South America’s northern coast. The State Department then paid for her to attend Boston University for a master’s degree in African studies, which she completed in 1970. But after the federal government had invested in her future, and despite her graduate degree, Palmer was turned down for two assignments in Africa after ambassadors wrote that they didn’t want her because she was a woman. A third ambassador in Ethiopia also said he didn’t want her because she was female. She ended up as a social secretary to his wife. In 1975, 9 percent of Foreign Service officers were women, according to Leader. As of 2007, it was 37 percent, according to the State Department. “Why not 51 percent, the same as the general population?” Palmer said. According to this, a Court Order dated January 19, 1989, found that the Department of State (“State”) had discriminated against women in the administration of a written examination that applicants for positions in the Foreign Service were obliged to take. As part of the relief awarded, it enjoined State from administering any written examination that had an adverse impact upon women. In 2002, plaintiffs and State entered into a Consent Decree. Pursuant to the decree, the court certified as a class all female applicants who took, but did not pass, the 1991, 1992, 1993, or 1994 Foreign Service Written Examinations. The decree also permitted 390 members of the plaintiff class to participate in the Oral Assessment phase of the Foreign Service application process. These women, referred to as the invitees, had the highest non-passing scores on the 1991-1994 examinations. I could not find the 1989 or the 2002 court documents, but have included links to some of the Palmer case documents available online below. May 11, 1990 | United States Court of Appeals, District of Columbia Circuit. The Department’s Bureau of Overseas Buildings Operations (OBO) is requesting submissions to pre-qualify firms for Design-Build (D/B) services for the design and construction of a Standard Embassy Design (SED) New Embassy Compound (NEC) in Laos, Norway, Dominican Republic and Papua New Guinea. Approximate Site 30,000 square meters. Estimated design-build cost: $110 to $145 million. Approximate Site 33,589 square meters. Estimated design-build cost: $145 to $185 million. Estimated design-build cost: $165 to $210 million.